The aggressively cute puzzle game Nezumi teku teku (roughly translated, Plodding Mouse) by cartoonist and game designer nezutako descends from a host of games that charge the player with protecting, guiding, or assisting mindlessly marching characters. The lineage that goes back to at least 1991’s Lemmings, but in this instance most resembles the games from the Gussun Oyoyo (1993, Banpresto/Irem) series. 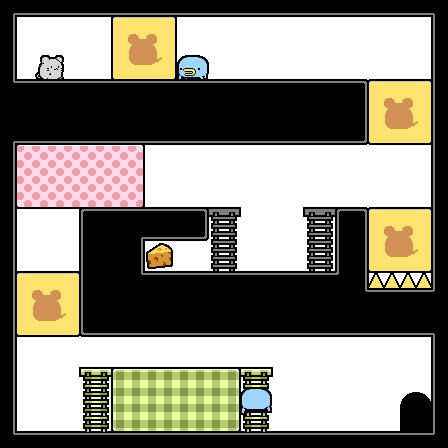 That game features the mechanic of Tetromino-like falling blocks and bombs that the player uses to build stairs, platforms, and walkways to allow a little walker to reach the end of the stage. Nezumi teku teku instead builds the movable platforms in as permanent parts of the stage. 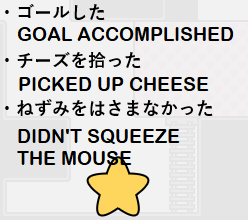 With mouse or touch screen controls (the game was designed to be played in browser on either your desktop or your smartphone), the player drags these movable objects across empty space and around corners. Rather than simply being blocks, these can be whole chunks of platform stages, complete with ladders that the pudgy little mouse will climb and other environmental objects. This isn’t a set-it-and-forget-it situation, though. The solutions to most stages require each piece to be moved more than once in response to the real-time movement of the plodding mouse, necessitating forethought, a careful hand, and quick reflexes. The game is appealingly and cleverly designed from the outset, but it becomes something more special as it opens up to reveals more elements. For one, later stages introduce Pac-man-style screen loops that reinvent the game’s approach of space. 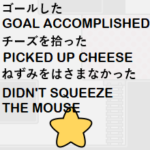 Later stages that require the mouse be led somewhere to open up a barrier sealing away a movable platform essential to the solution are especially nifty, giving the sense that the player and the slowly plodding mouse are solving these puzzles in actual collaboration with one another. Play Nezumi teku teku in your browser on nezutako’s site here. Also, see its Freegame Mugen page (Japanese only). Generally speaking, the game uses yellow buttons for positive things (like “yes” or “resume game”) and blue buttons for negative (“no” or “restart stage”).